You wanna know why you’re knocking on my door? Because I HAVE A DOOR THAT WILL CLOSE AND ALSO HAS A DOORKNOB! See that red sock? 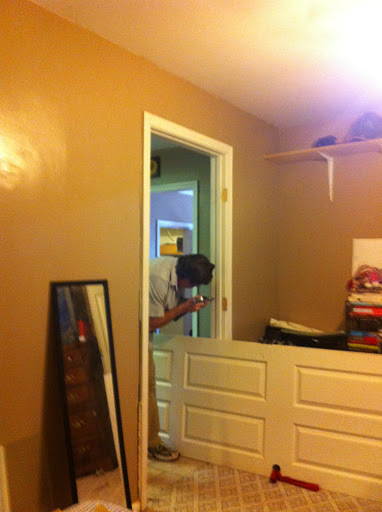 Yeah, that was my “doorknob.” And my door opened into my room (my tiny, tiny room) and took up space. I swear, when my door was shut, it looked like the Dorm Room of the Perpetually Lucky. Now, thanks to Tim the Tool Man El Jefe de la herramienta del hombre, my door swings out and has an actual knob. (so in the future, if there’s a sock hanging from the doorknob, don’t come in…) Also that mirror? IT’S HANGING NOW. Like on the wall. I rearranged my room and Rader’s this weekend, trying to make better use of the space. 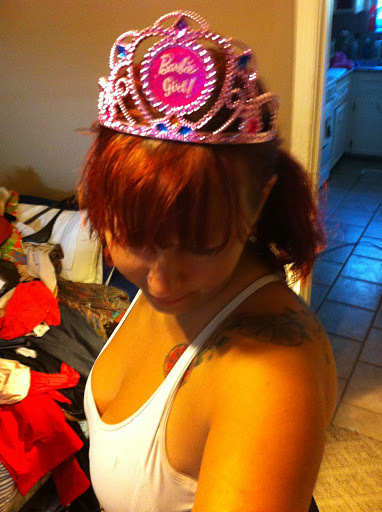 During my frenzied cleaning, I found a Barbie Tiara (what? doesn’t everyone have a Barbie Tiara just lying around their house?) Naturally, I wore it while I cleaned. You can see in this pic that my bed used to be located on the wall next to the door. Now it’s on the far wall and wow do I have a ton more room. I had to move my desk out to make that happen…but I’m glad I did. 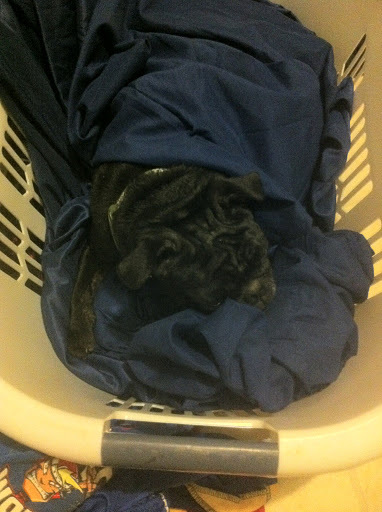 I’m not the only one who loves warm, clean sheets I guess. This entry was posted in Uncategorized and tagged changes, the compound, weekend by Just Call Me Mel. Bookmark the permalink.